Welcome to Partille camper site! Partille Camper Site is next to Partille Vandrarhem/Hostel and opened in the spring of 2017. We are situated in a green area 13 km from the city centre of Gothenburg as well as 13 km from Gothenburg Landvetter Airport. Close to one of the main hospitals( Östra sjukhuset). Bus 513 runs every 30 minutes, in two directions, to the city center(stop Åstebo). Direct bus to Liseberg amusement park ( 15-20 minutes). 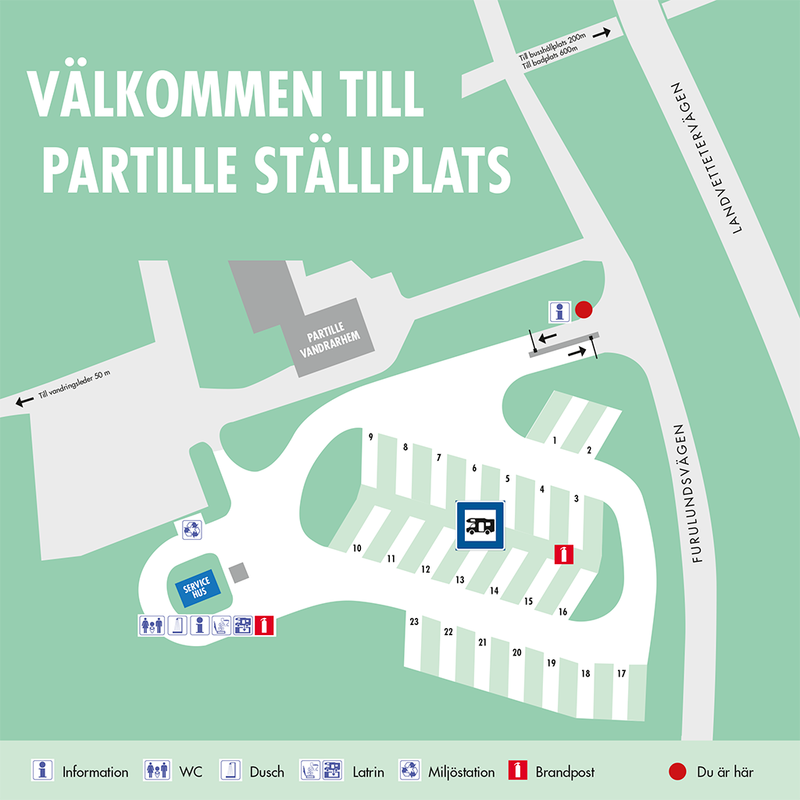 Partille Camper site is open all year and have 23 parking lots for campers and caravans. For prices see below. Max lenght 10 meters. Cars to be parked parallel to the caravans. We do not offer any spaces for tents. We are open 24 hours with self-service. You check in and pay automatically at the entrance. For longer periods contact the reception on the phone or by mail. Included in the rate: parking lot for campervan or caravan+car behind safety bars, free Wi-Fi, power outlet 16 A, possibility to empty fixedOr/and loose tanks, recycling station, repleneshing the fresh water and service building with toilets and showers. Daily charge from 12.00-12.00. Minimum 24 hours. 23 parking lots for campers and caravans! Only 13 km from Gothenburg! Map of the camper site. Please contact our desk for bookings more than 14 days.